This is called the Raja pose — you start out standing on the trapeze bar, then you hold onto the ropes, and wrap your feet around the outside the ropes, and slide down into this position. It’s really cool to do! I had so much fun at Circus Smirkus! I don’t have a single thing to complain about. Every thing about camp was great. The food, the location in upstate Vermont, the coaches, the counselors, and the other campers were all better than I could have hoped. When it was time for the end-of-camp show, I was really sad, but really excited, too. We did our “stumble through” (our first try at putting the whole show together) on Thursday, and performed for a packed audience in the big Mama Mia tent on Friday. Everyone was amazing in the show — you’d never have known we put it together that quickly. I was in three acts: juggling rings, trapeze, and mini-trampoline. I can’t wait until next year! I am definitely going back next year! One of the things I really enjoyed at Circus Smirkus was circus acrobatics — better known as “Acro”. For the first time ever, there’s a circus acrobatics class at the Lone Star Circus School here in Dallas, and it starts next week. 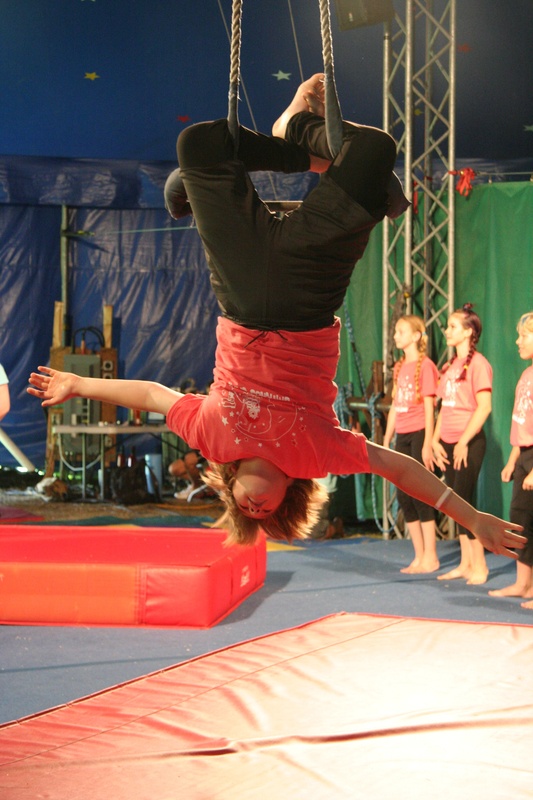 You can find a complete schedule of circus classes at www.lonestarcircus.com — come and join the circus with me! I’ll be there on Tuesday & Thursday nights, and Saturday mornings. It’s loads of fun, and you don’t have to be an advanced performer, gymnast, or acrobat to come to class. 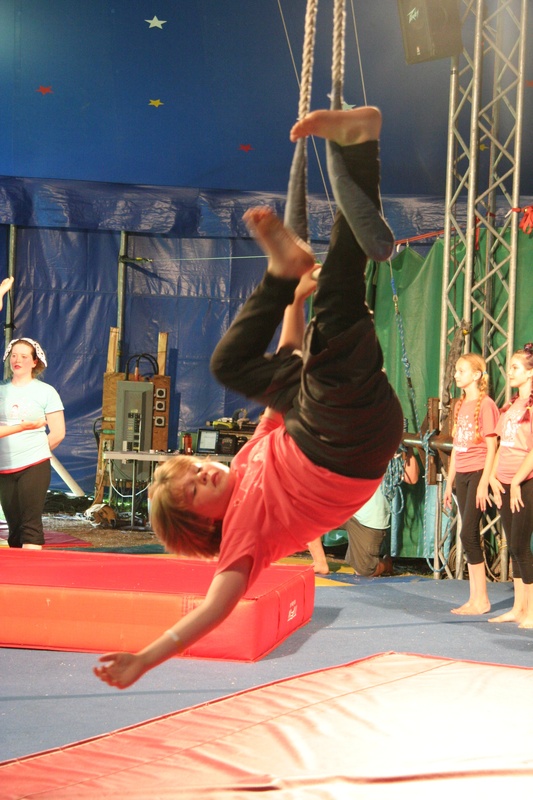 It’s 42 weeks until the 2014 Circus Smirkus Session IV starts, but just 7 weeks until applications open for the 2014 camp season. I can’t wait! This is me moving into position for the angel trick on the trapeze — it’s a one-legged post where you support your weight on the lower part of one leg. I love the trapeze!